A community’s downtown is the face it presents to the world. It is a reflection of community’s image, pride, and prosperity. It is also regarded as the historic core of the community. A vibrant downtown—or the lack of one—affects the community’s ability to attract and retain residents, businesses and institutions, jobs, and investments that enable a town to endure and thrive. Most studies in the past have focused on the big downtowns and the challenges present in revitalizing them. However downtowns in smaller towns are less frequently addressed. At one level, small and large towns do share some similar priorities when it comes to revitalizing their downtowns: they both need a comprehensive approach and need to leverage existing assets (Milder and Dane, 2013). But when looking at small towns more closely they’re surprisingly complex, from economic development challenges and analytical needs, to complex land use and transportation issues. They suffer from a chronic unemployment and lack resources and expertise to support and implement change. Last semester, the VT OED graduate students collaborated with Downtown Christiansburg Inc. (DCI) a local, all-volunteer, non-profit organization in Christiansburg to conduct an analysis of the downtown Christiansburg and provide strategies in revitalizing Christiansburg downtown. OED researchers took several approaches to this research, beginning with a socio-economic and mapping analysis of the downtown, an assessment of downtown revitalization best practices, and interviews with comparable organizations. On reviewing the best practices literature and community case studies, we found that several communities addressed the issue of lack of resources by using their biggest asset i.e. town people in responding to these challenges. 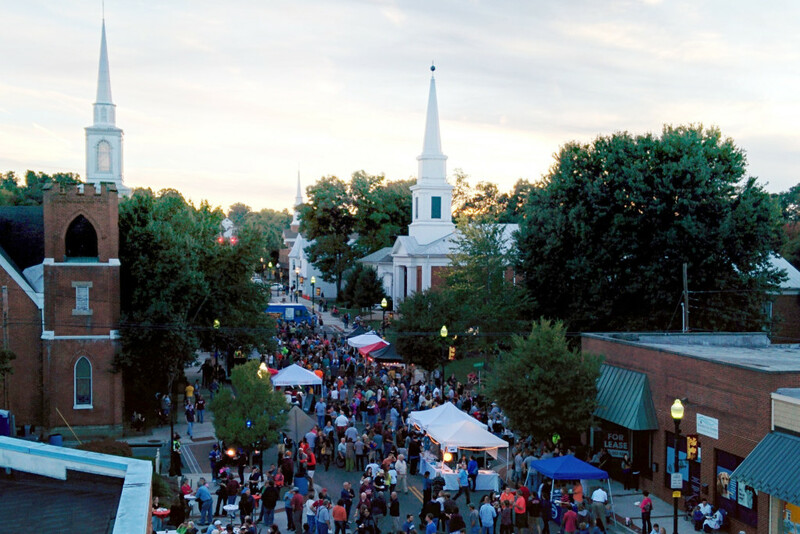 Moreover, interview with the Executive director, Downtown Wytheville Inc. (DWI) also reiterated the importance of local buy-in, successful community engagement, and strong partnerships with businesses in revitalization efforts. Firstly, local buy-in is important because community members should believe in the vision and mission of redeveloping downtown which would eventually lead to their contribution in revitalization efforts. For, instance, DWI gets around 30% of its revenue from sponsorships and donations from the local community. Secondly, participation from community members in revitalization efforts is crucial leading to successful community engagement. Many of Wytheville’s community members said they wanted to volunteer but were concerned about the time commitment. One way DWI worked to resolve this issue and prevent volunteer burnout was by forming sub-committee for events, which helped in attracting more volunteers since they require shorter time commitments. And lastly, DWI constantly made efforts in building strong partnerships with local businesses. Wytheville introduced a number of tax incentives to attract businesses to downtown. Moreover, DWI worked with the downtown property owners and the Town to provide incentives to increase mixed-use buildings in the downtown area to increase vibrancy of the downtown. Based on our findings, we suggested DCI focus their efforts towards identifying community stakeholders who could play an important role in increasing their public outreach. Additionally, we indicated that DCI should devote their time and efforts in increasing communication between DCI and the business owners.